Angina pectoris (AP) is the main symptom of myocardial ischaemia and is usually caused by atherosclerotic obstructive coronary artery disease (CAD). AP can have significant impact on quality of life, restricting daily work and leisure activities. The aim of management of stable AP is (i) to eliminate or minimize symptoms, thus improve quality of life, but also importantly to (ii) reduce long-term morbidity and mortality (prognosis). For treatment to be considered satisfactory both purposes should be fulfilled. Management options include optical medical therapy (OMT) and revascularization using percutaneous coronary intervention (PCI) or coronary artery bypass grafting (CABG)1,2.
oMT consists of one, two or more anti-anginal drugs to treat symptoms plus drugs for secondary prevention of cardiovascular disease. ƒÒ-blockers and/or calcium channel blockers constitute the fi rst line treatment. Recently Bangalore S et al, concluded that in patients (pts) with recent MI (one year or less), beta-blocker use was associated with a lower incidence of cardiovascular death, nonfatal MI, nonfatal stroke, hospitalization for atherothrombotic events or a revascularization procedure. However, signifi cant reservations have recently been voiced as regards ?-blocker use in pts without a previous MI by these authors3. In a post hoc analysis of the CHARISMA trial, they found a 31% reduced risk of the primary composite outcome among patients using ?-blockers, with a prior MI; this was driven by a roughly 40% reduced risk of new MI. However, in non-prior MI patients, the known atherothrombotic disease group and the risk-factors only group, no advantage was seen. In the latter group ?-blockers were actually associated with a trend toward an increased risk of stroke4. In addition to these two drug categories, long acting nitrates, nicorandil, trimetazidine or ranolazine which acts on the cellular level5, may reduce myocardial ischaemia, provide symptom relief and possibly improve prognosis. Ranolazine has been found to reduce the extent of myocardial ischaemia, by the use of scintigraphy6. Administration of ivabradine in patients (pts) in whom heart rate is not adequately controlled ( among pts with activity-limiting AP but not among those without activity-limiting AP7. The drugs for secondary prevention of cardiovascular disease are aspirin (starting from 75 mg and taking into account the risk of bleeding), statins and antihypertensive drugs for optimal lipid and blood pressure lowering8. Clopidogrel can be used as an alternative in case of aspirin intolerance9. The main indications for revascularization are persistence of symptoms, despite OMT, and an improvement of prognosis, according to the Guidelines of the European Society of Cardiology (ESC) on the management of CAD10. Ischaemic burden at non-invasive testing has a significant role in survival of pts with stable AP: Asymptomatic pts with a significant mass of ischaemic myocardium have been shown to obtain a prognosis benefit from revascularization11,12. The seminal COURAGE RCT randomized 2287 pts with known CAD and evidence of myocardial ischaemia to OMT alone or to OMT and PCI. At a median follow-up of 4.6 years, there was no significant difference in death, MI, stroke or hospitalization for unstable angina. After 1 year the PCI group had fewer symptoms of angina; however, at 3 years, there was no longer any difference between the 2 groups. After 5 years 21% of the PCI group and 33% of the OMT alone group had received additional revascularization (p<0.001). In this study, 31% of the pts had 1 vessel disease, 39% 2 vessel disease and 30% 3 vessel disease. Only 31% had proximal left anterior descending coronary artery (LAD) disease. Pts with left main disease were excluded and most pts had normal left ventricular function13. In a small nuclear substudy of the COURAGE trial, 100 pts with >10% ishaemic myocardium diagnosed with myocardial perfusion single photon emission computed tomography, had a lower risk of death or myocardial infarction (MI) with PCI14. Additional efforts are being directed towards establishing if certain subgroups of pts can be benefited by OMT or invasive therapy. In the recent FAME study, measurement of fractional fl ow reserve (FFR) in pts with multivessel CAD undergoing PCI with drug-eluting stents, significantly reduced the rate of the composite end point of death and repeat revascularization at 1 year15. Recently, the use of FFR has been upgraded to a Class IA classification in multi-vessel PCI in the ESC Guidelines on coronary revascularization10. Similarly, Muller et al, evaluated the long-term clinical outcome of pts with an angiographically intermediate LAD stenosis in whom revascularization was based on FFR; In 730 pts with a 30% to 70% isolated stenosis in the proximal LAD, when FFR was .0.80, the pts were treated medically (medical group); when FFR was <0.80, the pts underwent a revascularization procedure (13% CABG and 87% PCI). The 5-year survival of the medical group was compared with that of a reference population. The 5-year survival estimate was 92.9% in the medical group versus 89.6% in the controls (p = 0.74)16. Most previous meta-analyses have reported no mortality benefit, increased periprocedural MI and reduced need for repeat revascularization with PCI17-19. In a very recent meta-analysis of all randomized clinical trials from 1970 to 2011, initial coronary stent implantation with medical therapy was compared to OMT alone, to determine the effect of stenting on death, nonfatal MI, unplanned revascularization, and per sistent angina. Eight trials enrolling 7229 pts were identified. Three trials enrolled stable pts after MI, whereas 5 studies enrolled pts with stable angina and/or ischemia on stress testing. Mean follow-up was 4.3 years. The respective event rates with stent implantation and medical therapy were similar for death, nonfatal MI, unplanned revascularization and persistent angina. Initial stent implantation for stable CAD showed no evidence of benefit compared with initial medical therapy for prevention of the above endpoints20,21. In an older meta-analysis of seven randomized clinical trials, reduced mortality rates were found in pts with left main disease, 3 vessel disease (particularly when the proximal LAD was involved) and impaired LV function who underwent CABG, as compared to OMT alone22. The benefits of CABG may be even greater if one considers that most pts in the older trials had low severity of CAD and only 10% of CABG patients received an internal thoracic artery graft, which is the most important prognostic component of CABG23. A more recent meta-analysis reported a significant reduction in the hazard ratio for death with CABG versus OMT (HR 0.62, 95% CI 0.50-0.77). Revascularization was not associated with a significant reduction in nonfatal myocardial infarction compared with OMT24. According to two meta-analyses, the treatment of isolated LAD stenosis with PCI or CABG has the same endpoints concerning mortality, MI or cerebrovascular events. There is a significant increase in recurrent angina (three-fold) and revascularization (five-fold), with PCI, at 5 years follow-up25,26. More than 15 randomised clinical trials for multivessel CAD, compare PCI to CABG. Most pts in these trials had 1 or 2 VD (vascular diseases), with normal LV function and without proximal LAD disease. Metaanalysis of these trials reported superiority of CABG with a five-fold reduction in the need for revascularization and survival benefit in pts >65 years old (HR 0.82) and in those with diabetes (HR 0.70)27. In a recent observational study the ACCF National Cardiovascular Data Registry and the STS Adult Cardiac Surgery Database were linked, concerning patients 65 years of age or older who had two or three-vessel CAD without AMI. In a period from 2004 to 2008, 86,244 underwent CABG and 103,549 underwent PCI. The median follow-up period was 2.67 years. At 1 year, there was no significant difference in adjusted mortality between the groups (6.24% in the CABG group as compared with 6.55% in the PCI group). At 4 years, there was lower mortality with CABG than with PCI (16.4% vs. 20.8)28. In the MASS II study, 611 pts with multivessel disease were included and OMT versus PCI versus CABG were compared. At 5 years’ follow-up the composite primary endpoint (total mortality, Q wave myocardial infarction, refractory angina requiring revascularization) occurred in 36% of pts receiving OMT, 33% of pts who underwent PCI and 21% of pts who underwent CABG (p=0.003), with revascularization rates of 9%, 11% and 4% respectively (p=0.02)29. In the important SYNTAX trial, 1800 pts with three-vessel or left main CAD underwent CABG or PCI (paclitaxel-eluting stent were used) in a 1:1 ratio. Equivalent anatomical revascularization could be achieved with either treatment. At 12-months after randomization the rate of repeat revascularization was 13.5% in the PCI group vs. 5.9% in the CABG group, P similar rates of major adverse cardiac or cerebrovascular events, whereas in high scores, the event rate was significantly increased in the PCI group. This study concerned that CABG remains the standard of care for pts with three-vessel or left main CAD30. From the 5-year SYNTAX trial outcomes investigators concluded that major adverse cardiac and cerebrovascular events (MACCE) were 26.9% in the CABG group and 37.3% in the PCI group (p<0·0001). Myocardial infarction and repeat revascularization were significantly higher with PCI versus CABG. All cause death and stroke were not significantly different be tween groups. In patients with low SYNTAX scores MACCE was similar in the CABG and PCI groups (p=0.43). In the CABG group with left main coronary disease 31% had MACCE versus 36.9% in the PCI group (p=0.12); however, in pts with intermediate or high SYNTAX scores, MACCE was signifi cantly increased with PCI (intermediate score, 25.8% of the CABG group vs 36.0% of the PCI group; p=0.008; high score, 26.8%vs 44.0%; p<0.0001). Thus, CABG should remain the standard of care for pts with high or intermediate SYNTAX scores. For pts with less complex disease (low SYNTAX scores) or left main coronary disease (low or intermediate SYNTAX scores), PCI is an acceptable alternative. All pts with complex multivessel coronary artery disease should be reviewed and discussed by both a cardiac surgeon and interventional cardiologist to reach consensus on optimum treatment31. Goldenberg and Kornowski, also mentioned the importance of the SYNTAX score in treatment decisions for multivessel CAD32. However, an important question has not been adequately answered yet: Is the need for repeat revascularization driven by stentrestenosis or appearance of new stenotic lesions in areas not covered by the stents? In the very recent study of Cassese et al, in 10004 pts followed for 4 years, stent restenosis observed in 26.4% of pts, was a major determinant of long-term mortality, even in asymptomatic pts. However, the number of vessels presenting with new lesions was not mentioned33. In recent years, the use of DES has increased. Park et al, evaluated 3,042 pts with multivessel disease who received DES (1547 pts) or underwent CABG (1495 pts) with complete follow-up data for a median 5.6 years; 5-year risk of death and the combined risk of death, myocardial infarction, or stroke were similar between groups. However, the rates of revascularization were significantly higher in the DES group (HR: 2.93; 95% CI: 2.20 to 3.90, p <0.001). Similar results were obtained in comparisons of DES with CABG for high-risk clinical and anatomic subgroups with diabetes mellitus, abnormal ventricular function, age 65 years or more, and 3-vessel and left main disease. Mortality benefi t with DES implantation was noted in pts with 2-vessel disease (with proximal LAD 319 pts, without proximal LAD 549 pts), relative to CABG (HR: 0.57; 95% CI: 0.36 to 0.92, p = 0.02)34. The American College of Cardiology Foundation (ACCF) and the Society of Thoracic Surgeons (STS) compared long-term survival after PCI and CABG. They linked databases to assess data for years 2004 through 2008. They included pts 65 years or older, with 2 or 3 vessel disease without an acute MI; 86244 pts underwent CABG and 103549 PCI. At a 4 years the mortality for CABG was lower than that of PCI (16.4% vs 20.8%; risk ratio, 0.79; 95% CI, 0.76 to 0.82)35. Third generation DES are currently used more widely. In the very recent Dutch Peers study the use of 3rd generation DES provided excellent clinical outcomes with both zotarolimus-eluting and everolimus-eluting stents36. These excellent results raise an important question whether older generation DES or bare metal stents should continue being used. Many authors point out that even with the use of 2nd generation DES, dual anti-platelet drug therapy can safely be stopped at 6 months after stent implantation37. Moreover, questions are continuously being raised whether BMS are really safer as regards late stent throm bosis. Thus, in a secondary analysis of the DAPT trial in the 2014 AHA Scientific Sessions, Dr Dean Kereiakes actually found a lower thrombosis rate at 12 months with DES (1.7%) than with BMS (2.6%), p All in all 4 trials were presented in the AHA 2014 Scientific Sessions. In the large DAPT study population, which included fewer BMS and more DES, 30 months DAPT was associated with fewer stent thromboses, than with 12 months. Importantly ischaemic events increased markedly in the 3 months that thienopyridine was stopped, regardless of when that occurred, leading to suggestions that treatment should maybe continue longer, even for life. Dr Giles Montalescot, a thrombosis expert, summarizes the results of the 4 trials as follows: There is no common rule for duration of DAPT, it has to be individualized. If the patient had a new-generation stent and you want to stop DAPT early at 6 months you probably can. If the patient has multiple ishaemic factors or the Taxus stent in the left main, he should continue DAPT for a long time, maybe for ever. In this challenging entity CABG is still considered the best approach. However, PCI is being increasingly considered as a viable alternative. The 5 year SYNTAX results have already been discussed31. In a meta-analysis of 10 studies of 3773 pts with left main stenosis (including two randomized clinical trials and the MAIN-COMPARE registry), death, myocardial infarction, and stroke were similar in the PCI and CABG-treated patients at 1 year, 2 years and 3 years. Target vessel revascularization was significantly higher in the PCI group at 1 year, 2 years and 3 years. There was no difference in mortality in PCI versus CABG-treated patients at 1 year, 2 years and 3 years. The need for repeat revascularization was 4 times greater in patients who underwent PCI39. In a more recent meta-analysis Capodanno et al, identified 1611 patients with left main coronary artery disease, from 4 randomized clinical trials. PCI was associated with a nonsignificantly higher 1-year rate of major adverse cardiac and cerebrovascular events [death, MI, target vessel revascularization (TVR) and stroke] compared with CABG (14.5% vs. 11.8%; p = 0.11), driven by increased TVR (11.4% vs. 5.4%; p <0.001). Conversely, stroke occurred less frequently with PCI (0.1% vs. 1.7; p = 0.013). There were no significant differences in death (3.0% vs. 4.1%; p = 0.29) or MI (2.8% vs. 2.9; p = 0.95)40. In the BARI 2D Study Group, 2368 pts with type 2 diabetes and heart disease were randomly assigned to undergo either revascularization (PCI or CABG) with OMT, or OMT alone. In pts receiving PCI, there was no significant difference in primary end points between this and the OMT group. However, in pts receiving CABG, major cardiovascular events were significantly lower in the revascularization (22.4%) than in OMT group (30.5%, P=0.01)41. Figure 1. Chronic stable coronary artery disease (angina). Recently, the American College of Cardiology Foundation, the Society for Cardiovascular Angiography and Interventions, the Society of Thoracic Surgeons, and the American Association for Thoracic Surgery, conducted an update of the appropriate use criteria (AUC) for coronary revascularization44. In the initial document45, 180 clinical scenarios were developed to mimic patient presentations encountered in everyday practice and included information on symptoms, extent of medical therapy and risk level as assessed by non-invasive testing and coronary anatomy. In general, as seen with the prior AUC, the use of coronary revascularization for pts with acute coronary syndromes and combinations of significant symptoms and/or ischemia is appropriate. In contrast, revascularization of asymptomatic pts, or pts with low-risk findings on noninvasive testing and minimal medical therapy, are viewed less favorably. They suggest that CABG remains an appropriate method of revascularization for pts with high burden of CAD. However, additionally, they suggest that PCI may have a role in revascularization of pts with high burden of CAD. The primary objective of the appropriate use criteria is to improve physician decision making and patient education regarding expected benefits from revascularization. Inappropriate revascularization may be harmful to pts and generate unwarranted costs to the healthcare system, whereas appropriate revascularization procedures can improve patient clinical outcomes. For difficult cases, such as patients with heart failure or renal insufficiency, guidelines propose arbitration by a Heart Team which would consist of an interventional cardiologist and a cardiac surgeon46. Their recommendations may seem time consuming and somewhat timid to many interventionists. Moreover, these two problems, could have been taken into account before the patient comes to the catheterization laboratory and necessary preparations can be instituted. Still, the concept of the Heart Team is very useful, and should emphasize the need for a team approach in the management of our pts. In the following graph we summarize the chronic stable CAD (angina) diagnostic and prognostic stratification adapting from recent ESC guidelines10. We tried to make it as simple as possible. Our reflections after presenting all these data are the following: In stable CAD, all pts should have a functional test before coming to catheterization. A large ischaemic burden should alert to probability of left main, proximal LAD and/or 3 vessel disease. The last ESC revascularization guidelines10 favor stress scintigraphy and echocardiography and do not mention exercise electrocardiography at all. Still, in a male patient with a normal resting ECG, a typical history of angina at exercise and good exercise capacity, it is quite reliable. A “strongly positive” exercise test (2 mm ST depression) would obviate any further noninvasive test and direct him straight to coronary arteriography, anticipating the need for invasive therapy47. After coronary arteriography is performed, in pts with non-main, non-proximal LAD disease, without evidence of extensive ischaemia by non-invasive testing, if OMT adequately controls symptoms, it is the treatment of choice. Otherwise, the simpler PCI would be preferable to CABG, which however we would still prefer in left main, multivessel disease with proximal LAD stenosis and chronic heart failure with presence of viability. Finally, it should be underlined that in pts with CAD all three treatment modalities can be applied, frequently more than once during their lifetime, with the aim of improving their quality of life and survival. One aspect that is understressed is that OMT should be continued indefinitely with undiminished zeal after PCI or CABG. Thus, all 3 treatments should be considered complementary rather than competing48. 1. Boersma E, Mercado N, Poldermans D, et al. Acute myocardial infarction. Lancet 2003; 361:847-58. 2. Hemingway H, McCallum A, Shipley M, et al. Incidence and prognostic implications of stable angina pectoris among women and men. JAMA 2006; 295:1404-11. 3. Bangalore S, Steg G, Deedwania P, et al. ?-Blocker use and clinical outcomes in stable outpatients with and without coronary artery disease. JAMA 2012 ;308(13):1340-9. 5. Sendón JL, Lee S, Cheng ML, et al. Effects of ranolazine on exercise tolerance and angina frequency in patients with severe chronic angina receiving maximally-tolerated background therapy: analysis from the Combination Assessment of Ranolazine In Stable Angina (CARISA) randomized trial. Eur J Prev Cardiol. 2012;19(5):952-9. 6. Venkataraman R, Belardinelli L, Blackburn B, et al. A study of the effects of ranolazine using automated quantitative analysis of serial myocardial perfusion images. JACC Cardiovasc Imaging. 2009;2(11): 1301-9. 8. National Institute for Health and Clinical Excellence. Management of stable angina. (Clinical guideline 126). 2011. http://guidance. Nice.org. uk/CG 126. 10. Task Force Members, Montalescot G, Sechtem U, Achenbach S, et al. 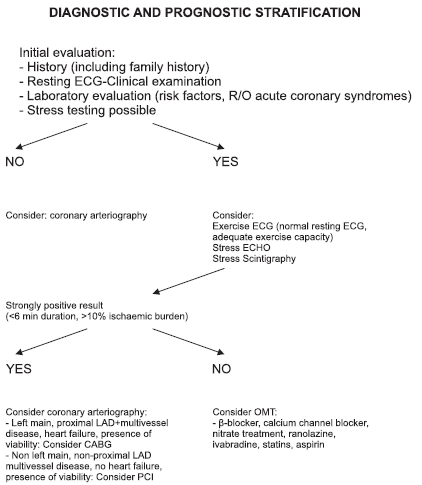 2013 ESC guidelines on the management of stable coronary artery disease: the Task Force on the management of stable coronary artery disease of the European Society of Cardiology. Eur Heart J. 2013;34(38): 2949-3003. 11. Davies RF, Goldberg AD, Forman S, et al. Asymptomatic Cardiac Ischaemia Pilot (ACIP) study two-year follow-up: outcomes of patients randomized to initial stragedies of medical therapy versus revascularization. Circulation 1997;95:2037-2043. 12. Hachamovitch, Hayes SW, Friedman JD, et al. Comparison of the short-term survival benefi t associated with revascularization compared with medical therapy in patients with no prior coronary artery disease undergoing stress myocardial perfusion sigle photon emission computed tomography. Circulation 2003; 107:2900-2907. 14. Shaw LJ, Berman DS, Maron DJ, et al. Optimal medical therapy with or without percutaneous coronary intervention to reduce ischaemic burden: results from the Clinical Outcome Utilizing Revascularization and Aggressive Drug Evaluation (COURAGE) trial nuclear substudy. Circulation 2008; 117: 1283-1291. 15. Tonino PA, De Bruyne B, Pijls NH, et al. Fractional fl ow reserve versus angiography for guiding percutaneous coronary intervention. N Engl J Med. 2009;360(3):213-24. 16. Muller O, Mangiacapra F, Ntalianis A, et al. Long-term follow-up after fractional flow reserve-guided treatment strategy in patients with an isolated proximal left anterior descending coronary artery stenosis. JACC Cardiovasc Interv. 2011;4(11):1175-82. 17. Bucher HC, Hengstler P, Schindler C, et al. Percutaneous transluminal coronary angioplasty versus medical treatment for non-acute coronary heart disease: meta-analysis of randomised controlled trials. BMJ 2000; 321:73-77. 18. Katritsis DG, Ioannidis JP. Percutaneous coronary intervention versus conservative therapy in nonacute coronary artery disease: a meta-analysis. Circulation 2005; 111: 2906-2912. 19. Trikalinos TA, Alsheikh-Ali AA, Tatsioni A, et al. Percutaneous coronary interventions for non-acute coronary artery disease: a quantitative 20-year synopsis and a network meta-analysis. Lancet 2009; 373:911-918. 20. Stergiopoulos K, Brown DL. Initial Coronary Stent Implantation With Medical Therapy vs Medical Therapy Alone for Stable Coronary Artery Disease: Meta-analysis of Randomized Controlled Trials. Arch Intern Med. 2012;172(4):312-9. 21. Gould KL, Johnson NP, Kaul S, et al. Patient selection for elective revascularization to reduce myocardial infarction and mortality: new lessons from randomized trials, coronary physiology, and statistics. Circ Cardiovasc Imaging. 2015 May;8(5). 22. Yusuf S, Zucker D, Peduzzi P, et al. Effect of coronary artery bypass graft surgery on survival: overview of 10-year results from randomized trials by the Coronary Artery Bypass Graft Surgery Trialists Collaboration. Lancet 1994; 344:563-570. 23. Loop FD, Lytle BW, Cosgrove DM, et al. Infl uence of the internalmammary-artery graft on 10-year survival and other cardiac events. N Engl J Med 1986; 314:1-6. 24. Jeremias A, Kaul S, Rosengart TK, et al. The impact of revascularization on mortality in patients with nonacute coronary artery disease. Am J Med 2009; 122: 152-161. 25. Aziz O, Rao C, Panesar SS, et al. Meta-analysis of minimally invasive internal thoracic artery bypass grafting versus percutaneous revascularization for isolated lesions of the left anterior descending artery. BMJ 2007;334:617.
surgery compared with percutaneous coronary interventions for multivessel disease: a collaborative analysis of individual patient data from ten randomized trials. Lancet 2009; 373:1190-1197. 28. Weintraub WS, Grau-Sepulveda MV, Weiss JM, et al. Comparative effectiveness of revascularization strategies. N Engl J Med. 2012; 366(16):1467-76. 29. Hueb W, Lopes NH, Gersh BJ, et al. Five year follow-up of the Medicine, Angioplasty, or Surgery Study (MASS II): a randomized controlled clinical trial of 3 therapeutic strategies for multivessel coronary artery disease. Circulation 2007; 115: 1082-1089. 30. Serruys PW, Morice MC, Kappetein AP, et al. Percutaneous coronary intervention versus coronary-artery bypass grafting for severe coronary artery disease. N Engl J Med 2009; 360: 961-972. 31. Mohr FW, Morice MC, Kappetein AP, et al. Coronary artery bypass graft surgery versus percutaneous coronary intervention in patients with three-vessel disease and left main coronary disease: 5-year follow-up of the randomised, clinical SYNTAX trial. Lancet 2013; 381(9867):629-38. 32. Goldenberg G, Kornowski R. Coronary Bypass Surgery versus Percutaneous Coronary Intervention. Interv Cardiol. 2012;4(6):653-660. 33. Cassese S, Byrne RA, Schulz S et al. Prognostic role of restenosis in 10 004 patients undergoing routine control angiography after coronary stenting. Eur Heart J. 2015;36(2):94-9. 34. Park DW, Kim YH, Song HG, et al. Long-term comparison of drugeluting stents and coronary artery bypass grafting for multivessel coronary revascularization: 5-year outcomes from the Asan Medical Center-Multivessel Revascularization Registry. J Am Coll Cardiol. 2011 11;57(2):128-37. 36. von Birgelen C, Sen H, Lam MK, et al. Third-generation zotarolimuseluting and everolimus-eluting stents in all-comer patients requiring a percutaneous coronary intervention (DUTCH PEERS): a randomised, single-blind, multicentre, non-inferiority trial. Lancet 2014; 383(9915):413-23. 37. Authors/Task Force members, Windecker S, Kolh P, Alfonso F, et al. 2014 ESC/EACTS Guidelines on myocardial revascularization: The Task Force on Myocardial Revascularization of the European Society of Cardiology (ESC) and the European Association for Cardio-Thoracic Surgery (EACTS)Developed with the special contribution of the European Association of Percutaneous Cardiovascular Interventions (EAPCI). Eur Heart J. 2014;35(37):2541-619. 38. Kereiakes DJ, Yeh RJ, Massaro JM, et al. Comparison of Ischemic and Bleeding Events after Drug-Eluting Stents or Bare Metal Stents in Subject Receiving Dual Antiplatelet Therapy: Results from the Randomized Dual Antiplatelet Therapy (DAPT) Study. AHA 2014 Scientific Sessions; November 18,2014; Chicago. 39. Naik H, White AJ, Chakravarty T, et al. A meta-analysis of 3773 patients treated with percutaneous coronary intervention or surgery for unprotected left main coronary artery stenosis. JACC Cardiovsc Interv 2009; 2: 739-747. 40. Capodanno D, Stone GW, Morice MC, Bass TA, Tamburino C. Percutaneous coronary intervention vs. coronary artery bypass graft surgery in left main coronary artery disease: a meta-analysis of randomized clinical data. J Am Coll Cardiol 2011;58(14):1426-1432. 41. BARI 2D Study Group, Frye RL, August P, Brooks MM, et al. A randomized trial of therapies for type 2 diabetes and coronary artery disease. N Engl J Med. 2009;360(24):2503-15. 42. Farkouh ME, Domanski M, Sleeper LA et al. Strategies for multivessel revascularization in patients with diabetes. N Engl J Med. 2012; 367(25):2375-84. 43. Dangas GD, Farkouh ME, Sleeper LA, et al. Long-Term Outcome of PCI Versus CABG in Insulin and Non-Insulin-Treated Diabetic Patients: Results From the FREEDOM Trial. J Am Coll Cardiol. 2014; 64(12):1189-97. College of Cardiology Foundation Appropriate Use Criteria Task Force, Society for Cardiovascular Angiography and Interventions, Society of Thoracic Surgeons, American Association for Thoracic Surgery, American Heart Association, American Society of Nuclear Cardiology, and the Society of Cardiovascular Computed Tomography. J Am Coll Cardiol 2012; 59:857-881. 45. Patel MR, Dehmer GJ, Hirshfeld JW, et al. ACCF/SCAI/STS/AATS/AHA/ASNC 2009 Appropriateness Criteria for Coronary Revascularization: a report by the American College of Cardiology Foundation Appropriateness Criteria Task Force, Society for Cardiovascular Angiography and Interventions, Society of Thoracic Surgeons, American Association for Thoracic Surgery, American Heart Association, and the American Society of Nuclear Cardiology Endorsed by the American Society of Echocardiography, the Heart Failure Society of America, and the Society of Cardiovascular Computed Tomography. J Am Coll Cardiol. 2009;53(6):530-53. 46. Authors/Task Force members, Windecker S, Kolh P, Alfonso F, et al. 2014 ESC/EACTS Guidelines on myocardial revascularization: The Task Force on Myocardial Revascularization of the European Society of Cardiology (ESC) and the European Association for Cardio-Thoracic Surgery (EACTS)Developed with the special contribution of the European Association of Percutaneous Cardiovascular Interventions (EAPCI). Eur Heart J. 2014;35(37):2541-619. 47. Gibbons RJ, Balady GJ, Bricker JT, et al. ACC/AHA 2002 guideline update for exercise testing: summary article. A report of the American College of Cardiology/American Heart Association Task Force on Practice Guidelines (Committee to Update the 1997 Exercise Testing Guidelines). J Am Coll Cardiol. 2002;40(8):1531-40. 48. Maragiannis D, Lazaros G, Vavuranakis M, et al. Chronic Stable Angina: Percutaneous Coronary Intervention or Medication. Hellenic J Cardiol 2011;52:246-252.